Astronomy is one of the oldest sciences. Every human civilization has observed the movement of objects in space and come up with stories and explanations for what they observed. While there are many many different early explanations, some of the earliest writings about astronomy were done by the Greeks. Aristotle was a Greek philosopher and astronomer who believed that the Earth was a sphere in the center of the universe. He believed that all of the other objects in the sky were physically attached to crystal spheres which revolved around the Earth. The movement of all objects in the universe was controlled by the outermost sphere called the Prime Mover. By the Middle Ages the Church had adopted Aristotle’s, but placed a Christian God in the place of the Prime Mover. Ptolemy was another Greek astronomer, who proposed a more advanced form of the Aristotle's model. The Ptolemic Universe suggested that the sun, moon, and planets, revolved around Earth on circular orbits, while the Earth stood still, but abandoned the idea of crystal spheres. These and other Early astronomers believed in a geocentric model of the Universe. A geocentric system is one with the Earth at the center remaining stationary while all other objects revolve around it. Both of these men, as well as the other early astronomers not mentioned, were brilliant scientists that have helped to shape our view of the world and our universe. We now know that despite their brilliance they were wrong, but still it is easy to understand how they came up with their theories, and why they were accepted. Everyday the Sun appears to rise in the East, travel through the sky and set in the west. Every night the Moon appears to rise, travel through the sky and set. Every night the stars and planets appear to move around. All of these observations are examples of apparent motion, meaning things appear to be moving, but are not actually moving. The apparent motion of the Sun, Moon, and Stars is why we believed in a geocentric system for so long. apparent motion is motion which appears to be occurring, but is not in reality. In the late 1500 the geocentric model met its first serious critic in Nikolas Copernicus. Copernicus made very careful observations of the movement of the planets and stars through the night sky. He noticed that the movement of some of the planets could not be explained by a geocentric model. Because of these discrepancies, Copernicus began to doubt the validity of a geocentric model of the universe. 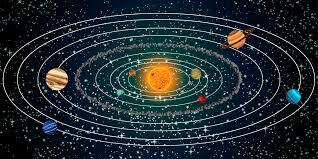 Copernicus came up with his own theory of the solar system, which put the Sun in the center instead of the Earth. This view is called a heliocentric model. heliocentric models place the sun at the center of our solar system. Copernicus died well before his ideas were accepted, but his work did not go unnoticed. Astronomer Tycho Brahe developed Copernicus’s model, and eventually his student Galileo Gallali invented the telescope and was able to definitively prove that Earth moves around the Sun. Despite the accurate science the notion of a heliocentric solar system was widely unpopular for many many years because of the influence of the Catholic Church. Isaac Newton helped to cement the acceptance of a heliocentric solar system by explaining HOW we were held in orbit around the Sun. Isaac Newton in addition to inventing calculus, also came up with the Theory of Universal Gravitation. Gravity is a force that attracts all objects with mass towards each other. 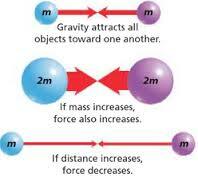 The strength of the gravitational pull depends on the mass of the two objects and the distance between them. The larger the mass of the object, the more gravitational attraction it has. The closer the two objects are to each other, the stronger the gravitational force.